Dundee was a relatively small ski area that operated in South Conway, NH. It was built sometime in the late 1960's, and lasted until at least 1973, according to the Ski Guide to the Northeast. The area had a t-bar and perhaps a beginner tow. 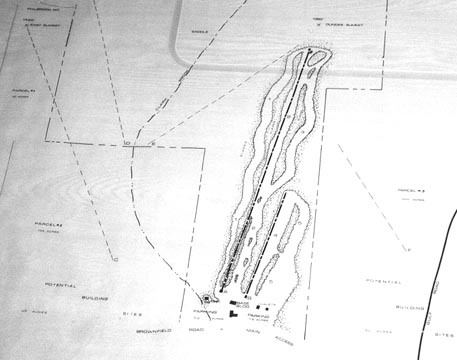 On the right is Sno Engineering's plan of the ski area, thanks to Joe Cushing. As you can see, there was just a few trails served by a longer t-bar. Dashed lines represent potential future lift sites. Imagine if this area had succeeded! 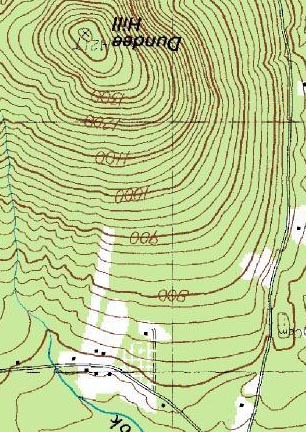 Here's the terraserver topo map of the lost ski area. The white areas represent the slope. It is unknown whether the ski area ever looked like the Sno Engineering map or not. Today, the trails have almost completely grown in, and you'd never know there was a ski area there. A trip by Jeremy (1998) and Betsy McDonough/Chris Bradford (2000) also indicate that the area is almost impossible to find. Its located off Brownfield Rd. If you have a GPS indicator, the area is at 43 deg 57' 22", long 71deg 00' 54" (from Paul King). Although I don't know much (virtually nothing) about it, I wanted to tell you a little about Dundee Ski Area in South Conway. Friends of mine owned a house in South Conway and had the sign for the ski area in the basement of their barn. Many of the locals have more information and have said that the base lodge still stands and has been renovated into a house. I have a potential new listing for you. In 1989 I rented a house in Center Conway NH the house was almost in Brownfield ME in the garage was a sign (very large ) that read - Ski Dundee- I did not think much of it until I found your site. The house is on Brownfield rd about 1 mile before you got to the house is a farm (on the right) The name of course is Dundee farm there was a large slope to the left of the farm (I think, its been a while) we all figured the two went together and left it at that.